Training Camp is imminent. Tuesday morning was the last Captain’s Practice I’ll attend this year. Other duties call, in LA. How fitting for a rival city to interfere with my fun. The guys started skating early on Tuesday, I understand some were due at a function around lunch time. Practice was well under way when I turned up at 9:30. I hesitated at the door because a couple of people were standing there looking through the glass. Well, in my head I hesitated. I looked the door over, saw there was no sign warning me away, and I went in. There may have been no hesitation in my stride. Monday, a charity golf event kept at least some Sharks away from the 10am practice. Acolatse and Greiss were the only Sharks there until 11, when McLaren ventured out. Acolatse entertained us early with some subtle trick shots, and later Nolan gave Greiss some unrelenting grief. I haven’t seen Greiss for a while, so I won’t make too much of that. Like, I won’t hope Nolan ends up with some team more distant than the Canucks. Well, maybe I’ll hope for that just a little bit. Tuesday, Sharks far outnumbered visiting skaters. Finally! Tikhonov, Stuart, Nolan and Cheechoo were there again, but there was only one other visiting skater, and two extra goalies. I’m not sure how many times I’ve seen this particular player at Sharks Ice but I know I’ve seen him at least twice now. I’ll call him 45. It is possible that the other players were helping him work on his balance, by knocking him down whenever they could. Or maybe 45 agreed to act as a human target for these morning skates. One spectator came over and asked who number 45 was. Number 45, or his fate, made a distinct impression on the audience. An old cowboy once told me that a horse only has so many stops in him. He was referring to sliding stops, something required of high-level western show horses (aka reining horses). Due to the physical strain on the joints and tendons, and the high level of reactive sharpness required, a horse can only do this so many times in its life. How many? You never know, so don’t waste those stops. Similarly, we only have so many starts in us, though we don’t know how many. Cameron MacIntyre is making a new start right now. The new glass and those new boards at Sharks Ice that I mentioned before: it is the same setup they will use at HP this season. It is awesomely bendy. It’s enough to make me wonder if it won’t have enough bounce to toss players back across the ice after they hit it. I don’t want anyone hurling himself around sooner than necessary but I am looking forward to seeing that glass in action. 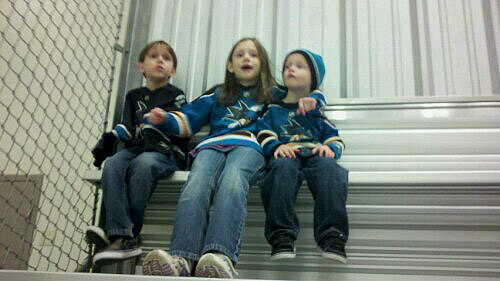 Jon Gustafson, General Manager of Sharks Ice, provided some details: “The actual glass system sits in a pliable seat. Within the boards there is a spring mechanism which allows the glass to be more flexible.” The glass in the corners doesn’t look any wider than before, but it is also attached to the boards with the new springy mechanism. This same system is being installed in various rinks around the NHL. Practice was a little more crowded Monday, there were even two goalies (woo hoo!) so a proper pickup game could be played. From the Sharks it was the same three as before: Burns, Greiss and MacIntyre, no new developments there. Also present were Owen Nolan, Brad Stuart and Viktor Tikhonov. I took a little tour of South Bay ice rinks this morning into afternoon. Despite being on the wrong side of the Bay for convenience, I found what I was looking for. A tour was not what I had planned, it just worked out that way and it’s how I trick myself into driving all over hell and gone. The skate was a little late getting started at Sharks Ice, which gave me time to wonder if, even after so many trips to this rink, I was wrong about where the unofficial optional and coachless practice-like activity would be taking place. I had the trusty tweet from David Pollak telling me it was to be in the south rink but the rinks are not labeled.